airport on 21st of July as the final big action of the nobordercamp. 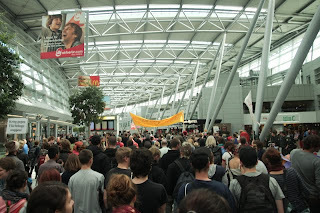 hard police-restrictions against a refugee protest in Dusseldorf. workers in these service companies. speech accusing this injustice and announcing increasing resistance. as profiteer of the deportation business. together for a loud and powerful indoor-demonstration. affected persons have been represented. colourful protests, which happened between 11 a.m. and 7 p.m.
to come for another protest in front of the gate 36 at the same day.